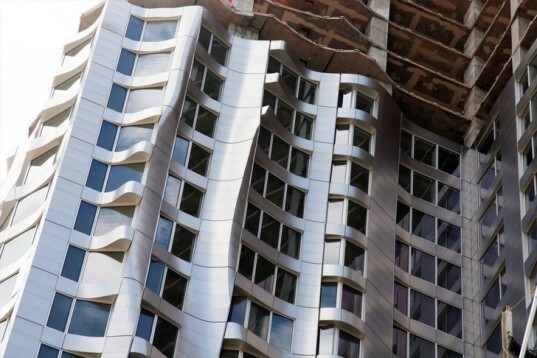 Iconic starchitect Frank Gehry's new building at 8 Spruce Street (a.k.a. the tower formerly known as Beekman Tower) has opened to much fanfare and buzz from NY architecture critics. 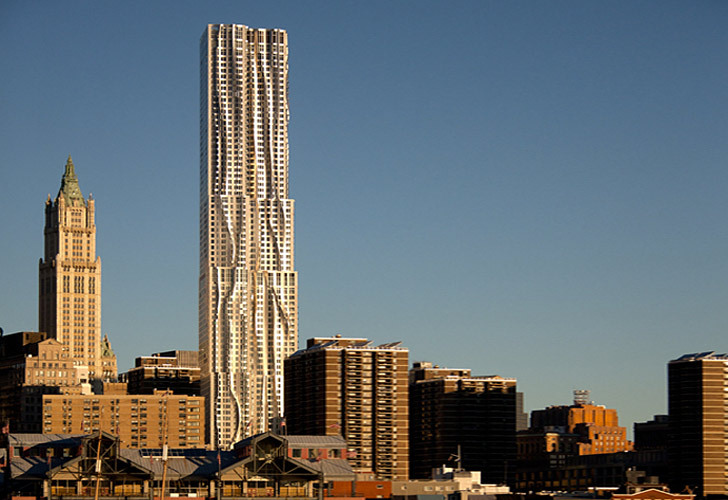 At 76-stories high, "New York by Gehry" is the tallest residential building in the western hemisphere, and some (a.k.a. Nick Ourousoff from the New York Times) are even calling it the best skyscraper since the 1960s. Seriously. We're not exactly sure why everyone is so gaga over an overly-designed tower that looks like it is melting (why?). But knowing Gehry's mixed feelings towards the LEED system, we had to wonder if 8 Spruce would be shooting for LEED certification. Word on the street is that the answer is no, but it may still have a few green tricks up its sleeve and surprise us anyway. Last year, Gehry raised more than a few eyebrows when he said that he felt LEED certification was often awarded for ‘bogus stuff’ and that climate change and sustainable design are “political”. He also mentioned that he didn’t feel that the costs associated with green buildings would pay for themselves “in your lifetime.” The legendary architect later appeared on Need to Know, a PBS current affairs show, to clear things up saying that he actually never said he was opposed to green building or to LEED but that LEED is just one way amongst many to measure and encourage environmentally conscious design. (Point taken Mr. Gehry). Given Gehry’s thoughts, it would have been surprising if his new tower were going for LEED, and according to Cityscapes, it won’t be. “It won’t be LEED certified,” a spokeswoman for the project told journalist Blair Kamin over the phone. “It is, in many respects, a green building. We [are] not going to go through the formal process.” We contacted the sales office ourselves to get word on what those sustainable features will be, and while we’re still waiting on the official word, a spokeswoman did tell us that the tower will have low-e windows, Energy Star appliances and greywater filtration. Bravo! Well, at least it is a step in the right direction. The greywater filtration is significant anyways, given the looming issue that water will become in the next decade. The 870′ tall building will also have lots of green/outdoor space including a 6th floor grilling terrace with views of the Woolworth building and dining cabanas, picnic tables and café seating. Rents start at $2,630 for studios, $3,580 for one-bedrooms and $5,945 for two-bedrooms and apartments are available for viewing now. met the man back in the early 90s and found him distinctly unlikable. that aside, his company manages to foist a lot of expensive ugly off on the world. Looks like it belongs in Dubai or Shanghai instead of New York. the non-conformist dares to not do as expected!? he must be punished! Good for Frank....Still, how are you gonna wash the windows outside when the building has few flat surfaces overall. How long until they have to replace it's steel facade. So much for energy savings. Last year, Gehry raised more than a few eyebrows when he said that he felt LEED certification was often awarded for ‘bogus stuff’ and that climate change and sustainable design are “political”. He also mentioned that he didn't feel that the costs associated with green buildings would pay for themselves "in your lifetime." The legendary architect later appeared on Need to Know, a PBS current affairs show, to clear things up saying that he actually never said he was opposed to green building or to LEED but that LEED is just one way amongst many to measure and encourage Mr. The legendary architect later appeared on Need to Know, a PBS current affairs show, to clear things up saying that he actually never said he was opposed to green building or to LEED but that LEED is just one way amongst many to measure and encourage environmentally conscious design. (Point taken Mr. Gehry). Given Gehry's thoughts, it would have been surprising if his new tower were going for LEED, and according to Cityscapes, it won't be. "It won't be LEED certified," a spokeswoman for the project told journalist Blair Kamin over the phone. "It is, in many respects, a green building. We [are] not going to go through the formal process." We contacted the sales office ourselves to get word on what those sustainable features will be, and while we're still waiting on the official word, a spokeswoman did tell us that the tower will have low-e windows, Energy Star appliances and greywater filtration. Bravo! Well, at least it is a step in the right direction. The greywater filtration is significant anyways, given the looming issue that water will become in the next decade. The 870' tall building will also have lots of green/outdoor space including a 6th floor grilling terrace with views of the Woolworth building and dining cabanas, picnic tables and café seating. Rents start at $2,630 for studios, $3,580 for one-bedrooms and $5,945 for two-bedrooms and apartments are available for viewing now.